A picturesque alpine Resort Village set in the Laurentians. An inspiring mountain with state of the art lifts. Award-wining championship golf on five courses. Graced with a European charm and radiating a warmth and charm all its own, you've discovered Tremblant. While the soul of Tremblant is the mountain, the heart is the village - with 50 shops and restaurants, a cinema, indoor/outdoor swimming pool and health club complex and a kids' club, along with premier hotels. The #1 ski resort in eastern North America boasts 92 runs, a heated gondola and the world's finest snow school programs. Combined with hiking, rock climbing, tennis, mountain biking, inline skating, horseback riding and water sports in summer, you'll run out of time long before you run out of things to do. Flowing from the western Laurentian Mountains, the Rouge River cascades down the ancient granite of the Canadian Shield. Rated one of the top 10 rivers in North America for whitewater rafting, the level 3 and 4 rapids provide exhilarating rafting through challenging and technical water. During the Symphony of Colors, when summer turns to fall, the dramatic reds, vivid oranges and burnished golds intensify the beauty of the Laurentian Mountains. Don't miss these crisp autumn days. Ride the chairlift to the top of the mountain and view the countryside awash in color. Just 30 minutes from Mont-Tremblant is the beautiful village of Val-David. Situated along the banks of the Riviere du Nord, and surrounded by forests and mountains, the village is paradise for outdoor lovers and an inspiration for artists. Boasting unique galleries and shops, this traditional French Canadian community is also well known for its outstanding rock climbing. Treat yourself to the superb Italian cuisine and intimate atmosphere of Coco Pazzo at Le Deslauriers in Tremblant Village. Its exceptional ambience echoes the graceful, old world atmosphere of "Vieux Tremblant." Afterwards, stroll the cobblestone streets, pausing to browse at intriguing boutiques. 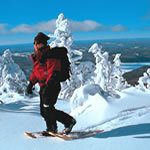 For more information on Tremblant, click here. Winding through stands of stately pine trees and rolling bunkers, Le Diable (“The Devil”) can best be described by a single word – dramatic. The renowned team of Dr. Michael Hurdzan and Dana Fry took their inspiration from the eye-catching Arizona-style golf courses. Their team created 18 sinuous fairways, each leading to an oasis of green surrounded by a seemingly endless desert of fiery red sand. Le Diable hosted the 1999 Export “A” Skins Game as well as Canada’s Prime Minister Jean Chrétien and former U.S. President Clinton. Famed course architect Thomas McBroom’s Le Géant is mountainous and muscular. 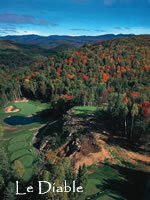 Le Géant’s design merited Golf Digest’s 4 ½ starts award in 1998, and was ranked one of the Top 50 Courses by SCORE GOLF. As if the long fairways, spectacular views and split-level plateaus weren’t enough to challenge a golfer’s concentration, there are two manmade lakes and 52 carefully-placed soft white sand features to contend with. Attracted by the fur trade, European settlers first arrived in Quebec in the 1600s. It was during that time that the First Nations people introduced the settles to maple syrup, and it has been a favorite Quebecois tradition ever since. Before modern methods of extensive piping and industrial boilers, settlers tapped trees by hand and left hanging buckets to collect the sap, “a sweet, watery liquid that flows through Maple trees in springs”. The buckets were collected two to three times a day and taken to a “sugar shack” (known in Quebec as a Cabane à sucre), where they were dumped into huge pots and boiled over log fires. The maple harvesting lasted three to six week, and when finished a “sugaring-off” celebration was held to mark the end of the flowing sap. Friends and family gathered at the sugar shack for a traditional meal of pea soup, omelets, fried pork rinds, maple-cured ham, boiled potatoes, beans baked in a pure maple syrup and pancakes to celebrate. As a seasonal treat, maple taffy was made by pouring the syrup directly on the snow. Outdoor activities and dances were encourage to burn off the excess calories. This unique sugaring-off party tradition continues today in eastern North America, in New Brunswick, Nova Scotia, Ontario, Manitoba and many American states which produce maple syrup. But it is Quebec that dominates the industry, producing approximately 90 percent of the world’s maple syrup. Be sure to take advantage of a “sugaring-off” party in Tremblant from March to early May. If you visit outside these months, you can still participate in another local culinary tradition, tourtière. Summer in Tremblant is as full of excitement as winter. Swimming, sailing, white-water rafting, water-skiing, boating, and tennis ar a few of the refreshing warm weather options. A 6 mile/10.2 km paved path links Trembant Resort to the original village Mont Tremblant. Residents and tourists alike walk, run, cycle or in-line skate between the two quaint town centers. Take autoroute des Laurentides (15 North) to Sainte-Agathe. Just past Sainte-Agathe, Autoroute 15 North merges to become Route 117 North. Follow Route 117 North (2 km/ 1.2 miles) past Saint-Jovite to Montée Ryan intersection. Take exit 119 Montée Ryan. Follow Montée Ryan to the end. Turn right and follow TREMBLANT signs to the resort.